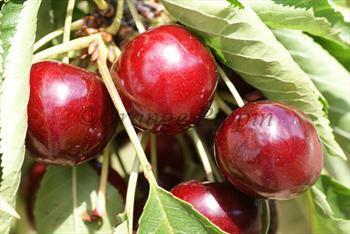 Summer Sun is an excellent modern English dark red cherry variety with firm-soft flesh and a good flavour. It is one of the best cherry varieties for the UK climate, being a consistently heavy and reliable cropper even if the summer weather is indifferent. Please fill in the details below and we will let you know when Summer Sun cherry trees are back in stock. Summer Sun is in flowering group 3. Summer Sun is self-sterile and needs to be pollinated by another tree of a different variety nearby. Since it flowers in the middle of the blossom season it can be pollinated by most other cherry trees. Summer Sun is not self-fertile, and ideally needs another compatible variety nearby such as Stella or Van or Lapins. Summer Sun is itself a very good pollinator of other cherry varieties. The blossom of Summer Sun is also quite resistant to frost damage, helping it to set a crop even in a difficult spring. Summer Sun grows with a compact spreading habit - if you select the Gisela 5 rootstock it makes a good choice for smaller gardens. Summer Sun was developed in the 1960s at the John Innes Centre, Norfolk UK. It was not originally considered to have any commercial value, and was not even registered for royalty purposes. A trial tree growing at the National Fruit Collection at Brogdale was considered to be only a light cropper - until a keen-eyed researcher realised this was because the tree was on the end of a row, and not properly covered by the anti-bird net which protected the other trees. It was then taken on by the Frank P. Matthews nursery in the west Midlands, who found it to be one of the best cropping mid-season cherries then available. It also proved to be precocious (cropping from an early age) and the blossom was quite resistant to spring frost damage. In short, after a false start it went on to establish itself as one of the best-adapted dessert cherries for the UK climate. The John Innes insititute was also involved in the very early work on self-fertile cherries in the 1940s - but Summer Sun was not part of that project. It is sometimes reported as being self-fertile, but this is most likely because it can set a crop even in a difficult spring when other varieties might fail.